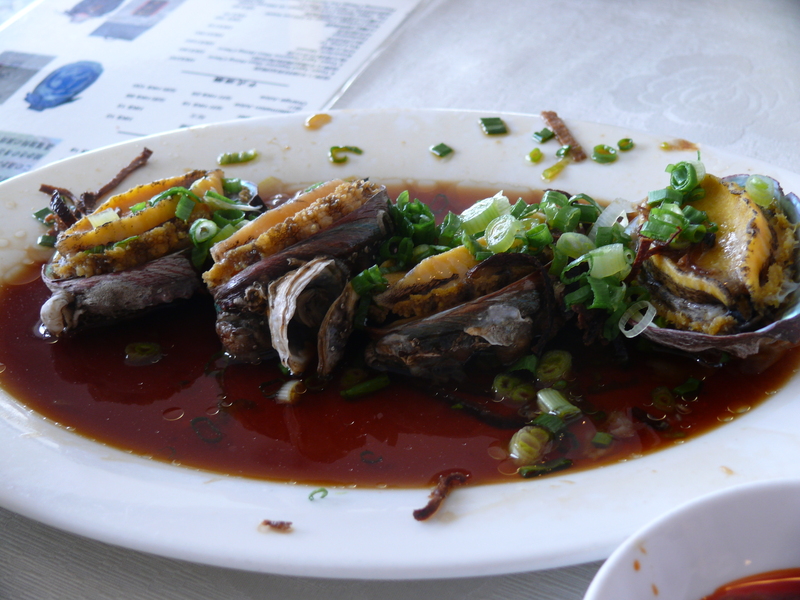 The Lee Yue Mun Pass is famous for seafood, why ? Because it is known as the First Channel Under Heaven (天下第一水道). It has quite long a history and is a very famous spot for tourist and local people both for seafood eating and sight-seeing. 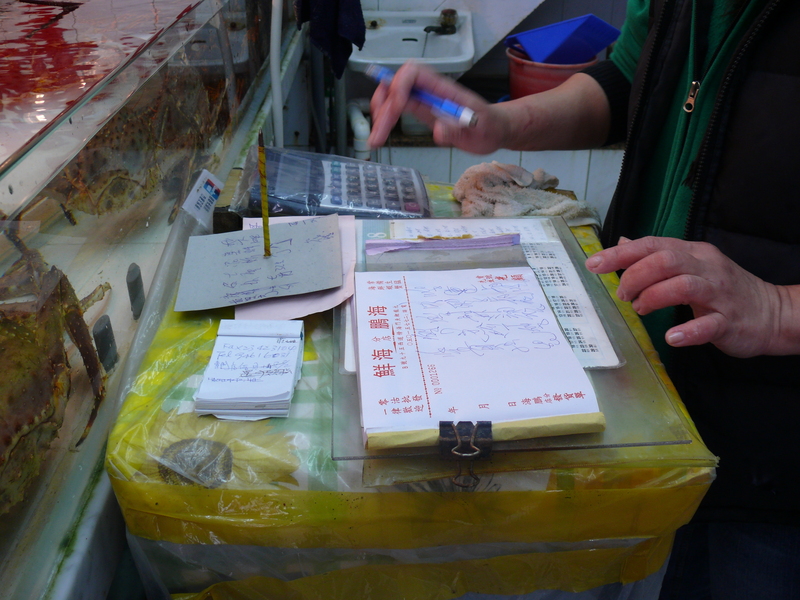 Formerly when Hong Kong was a fishery port it has been existing, and all seafood were picked up in nearby areas. 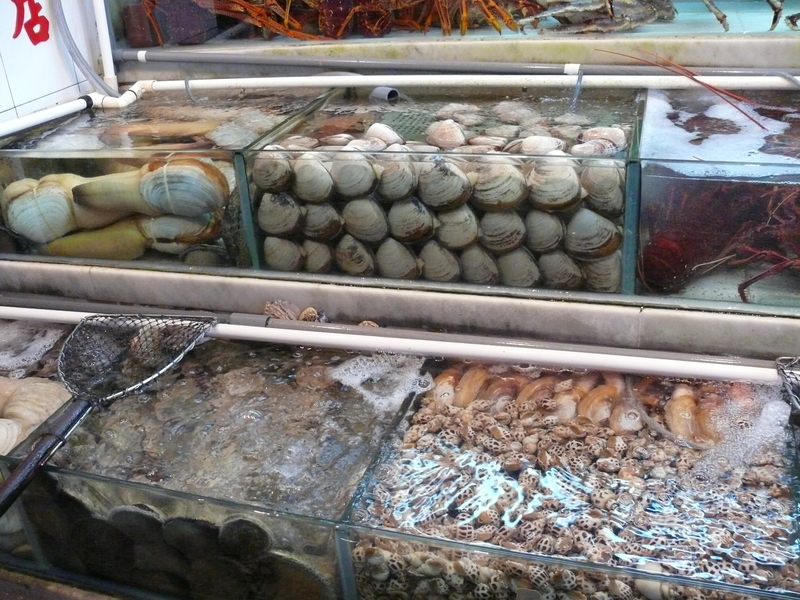 Now the products are from various parts of the world, and is famous for deep sea food far beyond the continents. They come from every ocean of the world. 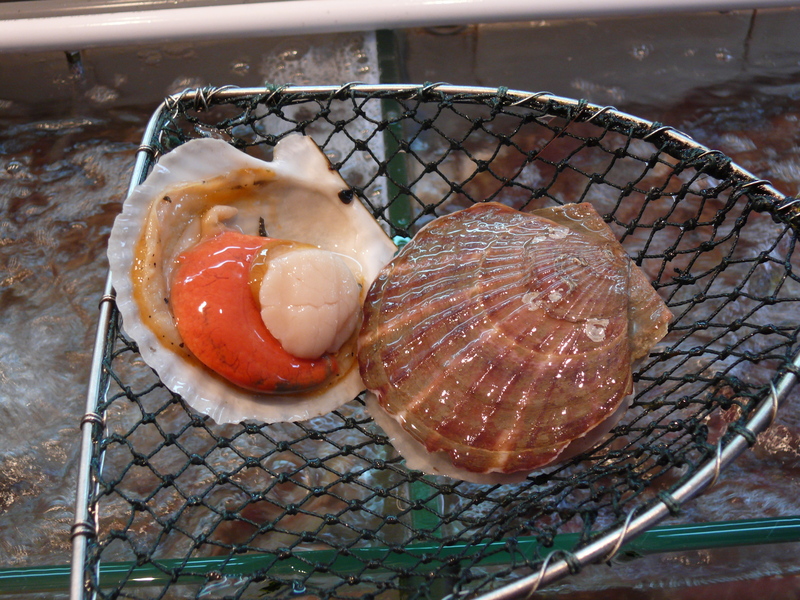 They are famous for fresh and rare seafood, even of the same category; they are of the highest rank. Thus, their price would also be of a higher rank in Hong Kong. Normally, a two person meal would cost around HK$1,000. The meal is divided into two parts, first you have to buy the food from the array of shops and then go to other restaurants for preparation. They are of two different businesses. That is the restaurant need not to keep the stock but cook the food only, and the shop is solely to keep the latest stock and would not cook, so as to make it more professionalized. The above is known as cattiefish (扇貝), literally it is called fans shell, for its shape is like a Chinese fans opening. Actually its an enlarge shell in size. The size is as large as the palm of my daughter. She is taking a photo with her mobile. It also belongs to mollusk shell (貝殼類海產). Its my favorite cuisine here. 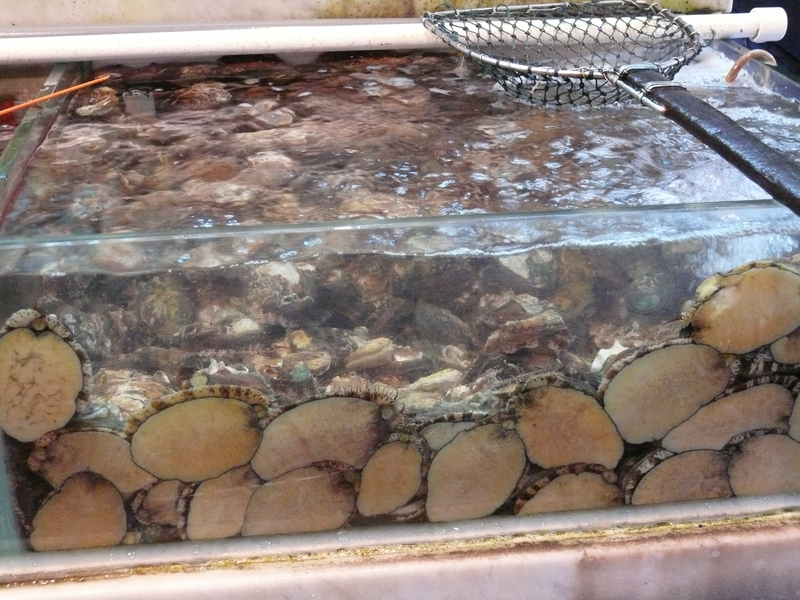 This is abalone(鮑魚), the academic term is known as Haliotis discus. My adaptive daughter comes (remember its come and not came) from a very inland city, anyway not seashore city. 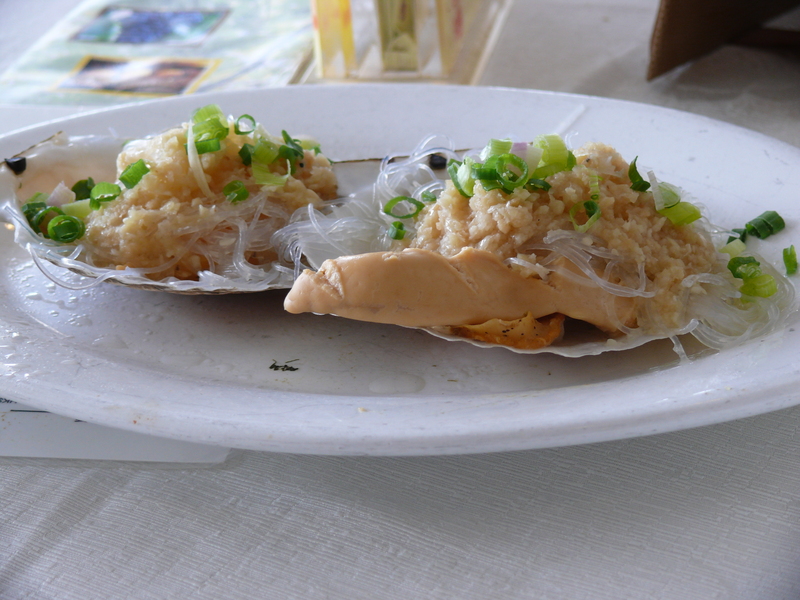 I was told that she never had tried any abalone before, so I led her to Lee Yue Mun Pass to taste fresh abalone. 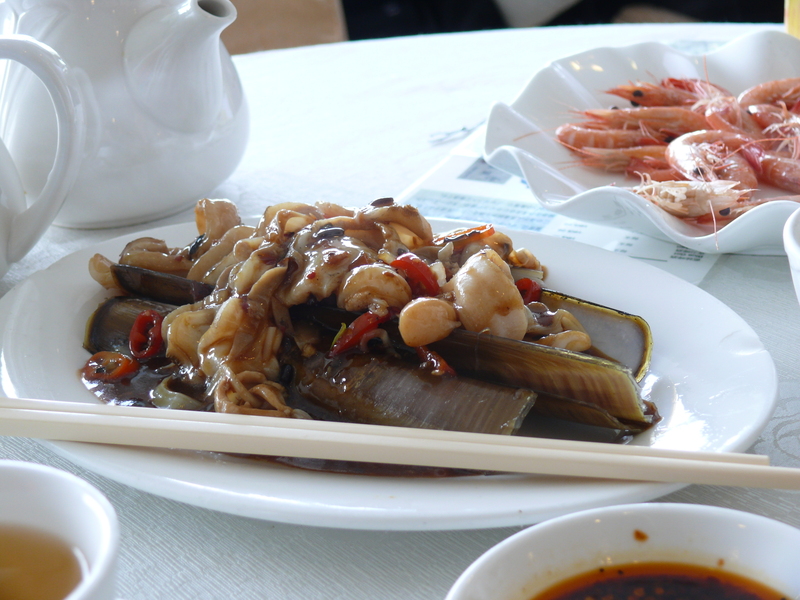 The following dish is HK$240 for cost of buying seafood only. Mind that even in a Chinese restaurant, when eating abalone, we use fork and knife for that course, just to show that it’s quite special and different from other courses. 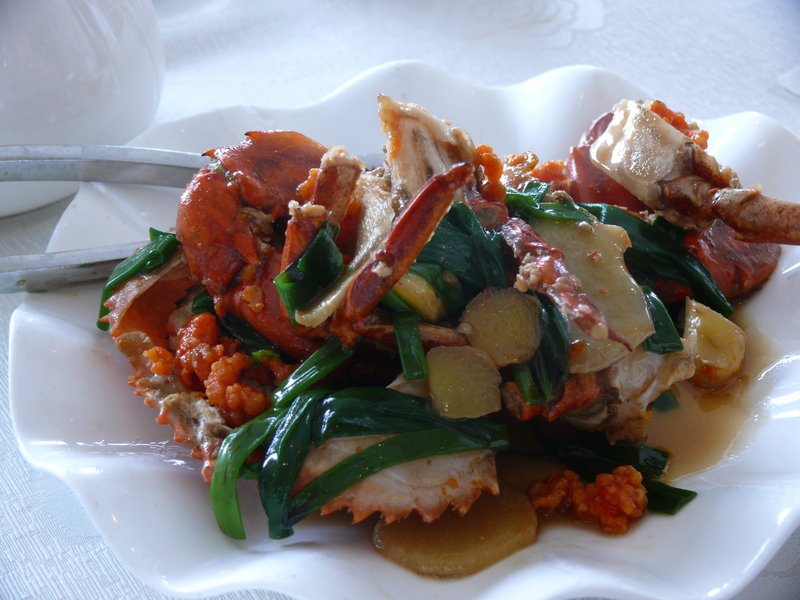 My daughter also never tried crab(螃蟹), it also belongs to crustacean(甲殼類海產). When it is cooked, it’s like following. 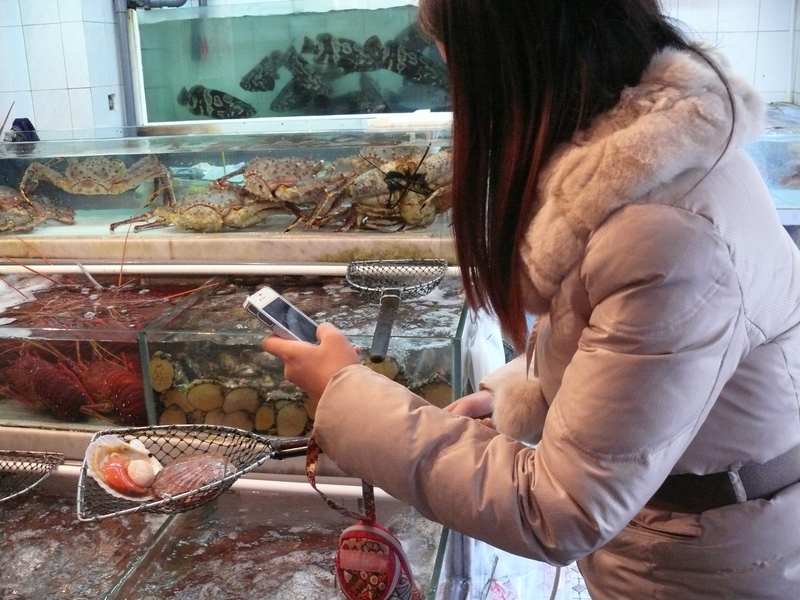 The eating format in Hong Kong is quite civilized, we use special clamp(鉗) to eat crabs. 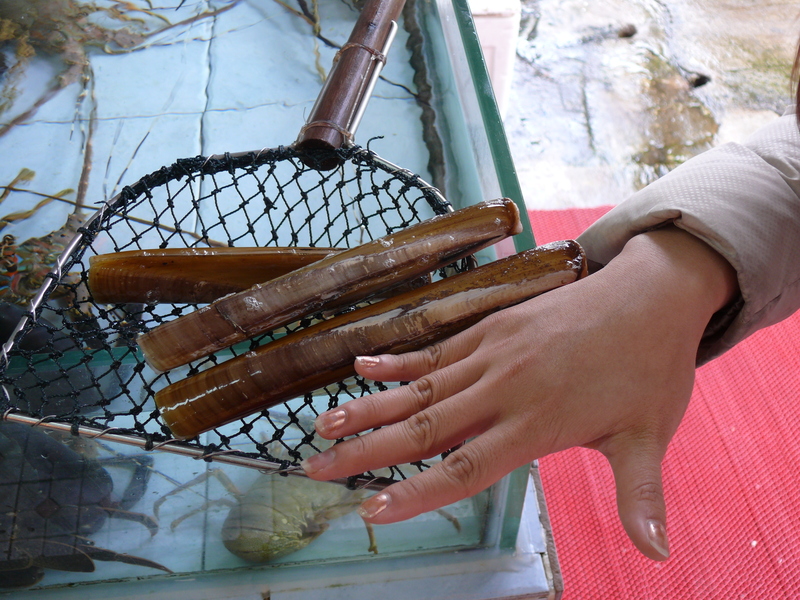 It is used to break the crab pincers (蟹鉗). Of course I have to teach my daughter how to use those clamps and reserve the crab shell for her which is the most precious part of this cuisine. 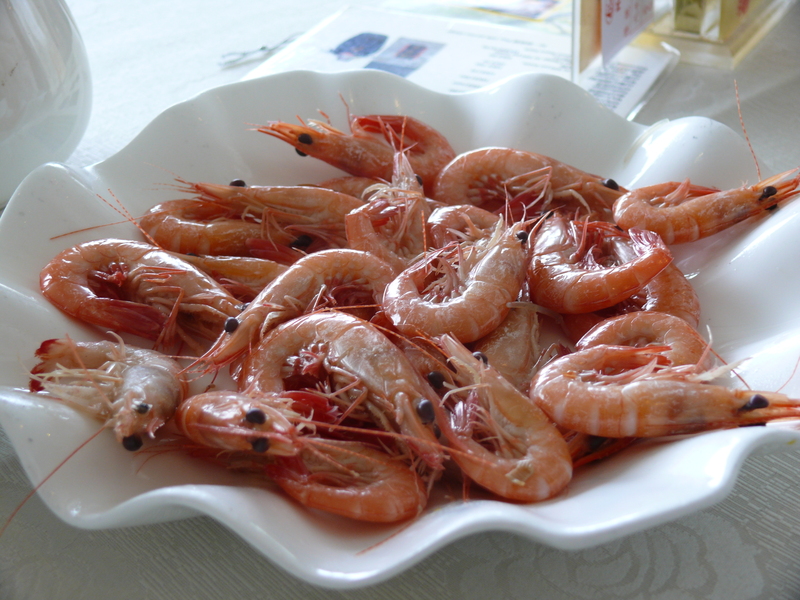 The last course is shrimp, it belongs to shellfish type (軟體類海產). 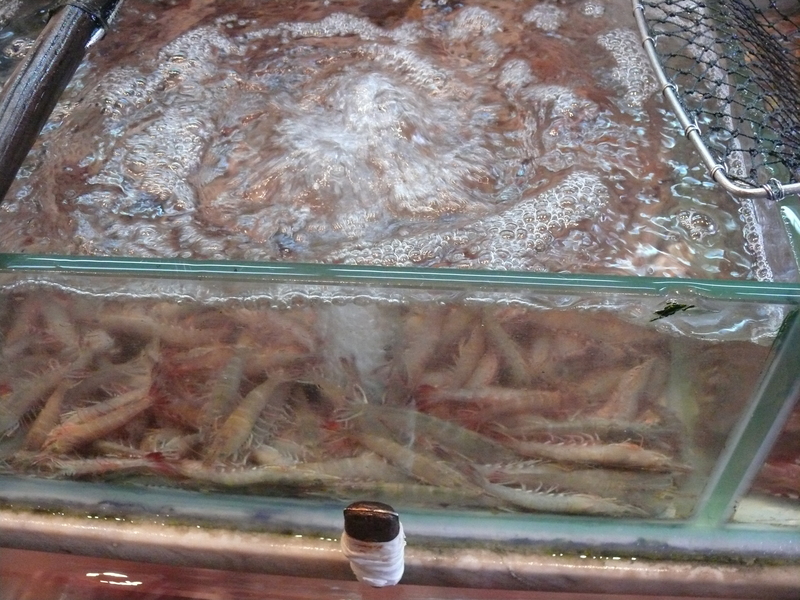 For fresh shrimp, we have a famous Cantonese cuisine known as white boiling(白灼), that is to put them into boiling water and take out at once to serve with shells. But we have to use special condiment (佐料) sauce. 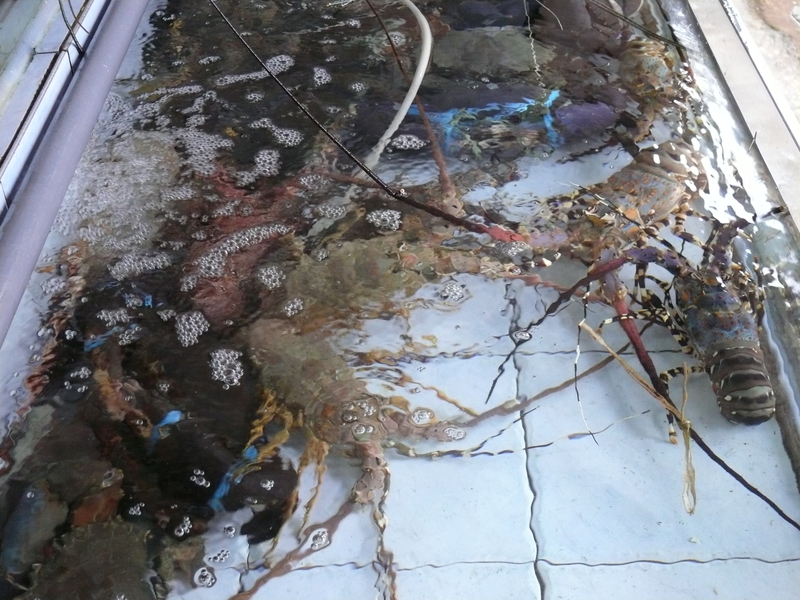 For this cuisine, we would not use any clamp to break the shell, as they are not as rigid as crab shell, it belongs to the soft shell type only. We have another format of civilized eating for White Boiled Shrimps. That is to use hands to break the shell. But after eating, we use the tea to clean the hands as following. My daughter is very surprised on using tea as washing. She is also afraid that she would wrongly use the washing tea to drink. So how can we distinguish two pots of tea, which one is for washing and which is for drinking ????????? I would tell you next time, when you really have a chance to go to Lee Yue Mun. So how about the charge of restaurant for cooking of the food? For preparation of food they would charge HK$100 per person no matter how much food you have brought, but for other places like Cheung Chau(長洲), it is based upon HK$40 per dish and would not count how many person you are. Both types still have to add the cost of tea and condiments and 10% service charge. So above is the bill, they do not use Arabic figures as you use in school, they use traditional ancient Chinese characters as following. That’s why I brought my daughter over there, for she had never encountered such Chinese figures in mainland. It quite nice to be my daughter but I have too many already and do not want any more. Please scroll on the right hand side of this page, and you will see a column named “Categories”. Just click on the item”Eating around the world” and you can see my related article concerning this topic.